You’re ready to look at how to build your network, with tools and forms provided by LinkedIn. Your first step is to decide who you want to invite to connect with you on LinkedIn. Be sure to completely fill out your profile before you start inviting people to connect. Having a complete profile makes it easier to find former colleagues and classmates. After all, if you invite someone to connect who you haven’t spoken to recently, he’ll probably take a quick look at your profile before responding. If he doesn’t see something familiar in your professional history, he will most likely ignore your invitation. You feel compelled to start inviting friends and colleagues to connect with you right away, before working on your profile or thinking of a strategy. You get nervous and decide not to invite anybody beyond one or two close friends or family members. You wonder about the value of LinkedIn and leave your account alone for a long period of time with no activity. 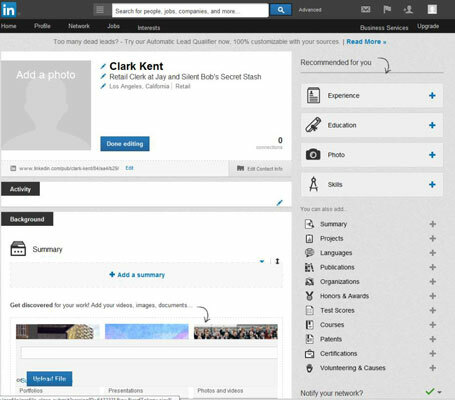 When you want to start using LinkedIn, begin by navigating to the home page and clicking Sign In. You are asked for your e-mail address and LinkedIn password, which you provided when you joined the site. After you are logged in, you can access any of the functions from the top navigation bar. To start building your profile, hover your mouse over the Profile link in the top navigation bar and then click Edit Profile. You see your Edit Profile page. Simply click the links that look like pencils (those are Edit links) or click the Add links and follow the instructions to fill out your profile. Next, start thinking about who you’d like to invite to join your network. LinkedIn provides some neat tools to help you identify, in your existing networks, people you know and trust well enough to feel confident about inviting them and expecting that they will accept. 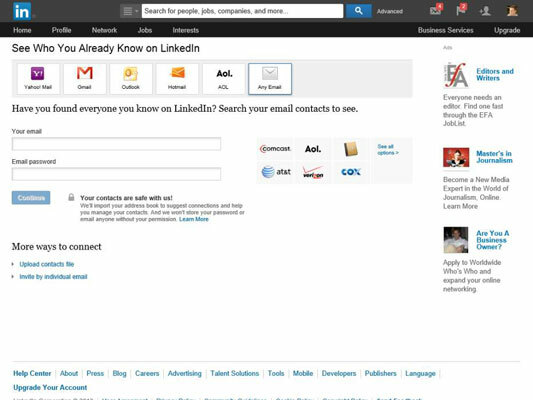 The Add Connections section of LinkedIn is always available by clicking the Network link from the top of any LinkedIn page, and then clicking the Add Connections link from the drop-down list that appears. The Add Connections section incorporates some basic options to identify and grow your network. Check the address book for your web-based e-mail system, like Yahoo! Mail, Gmail, Hotmail, and AOL. Check your address book for contacts to invite with options for systems like Microsoft Outlook and Apple’s Mail app by importing your desktop e-mail contacts with the link provided. Upload contact files from other applications. Spend a little time thinking about who you want to invite. Then focus on getting your profile set up, and then invite people.